Hey guys, I got married!!! After a long and emotional day, we got home at midnight and at 8AM we were on a flight to Orlando, Florida. 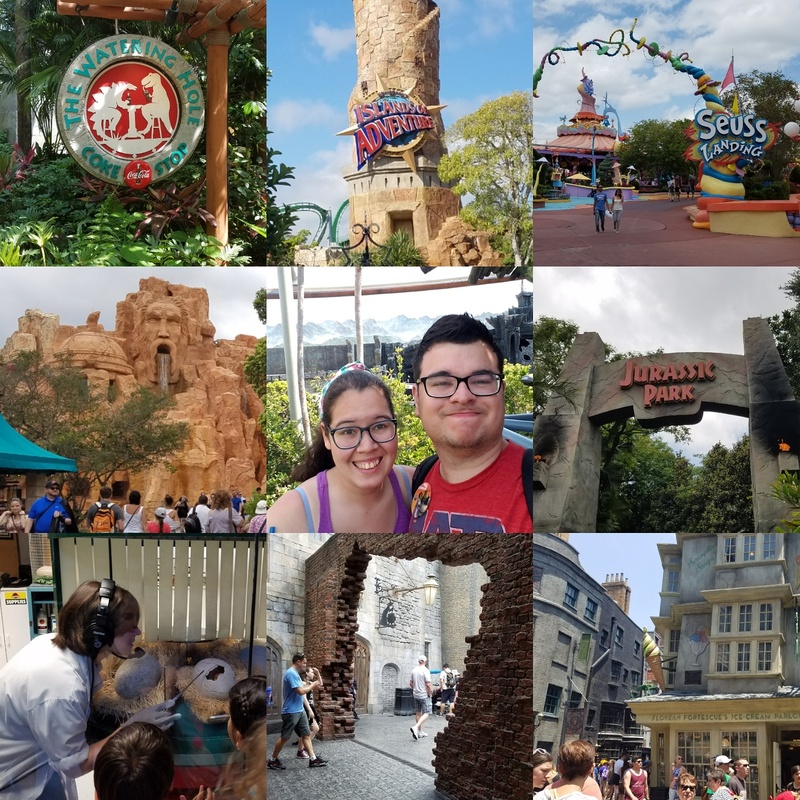 We had a four day pass to Universal Studios and Islands of Adventure, and we went to both with a small list of goals: have fun, be together, and Harry Potter. 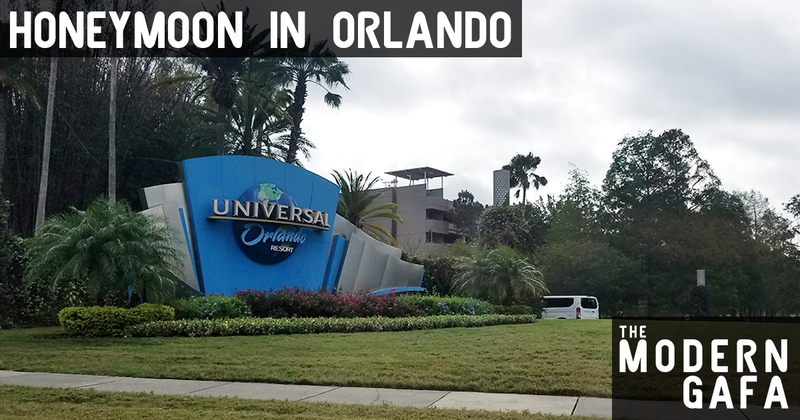 Read on to find out how our romantic week in Orlando went. 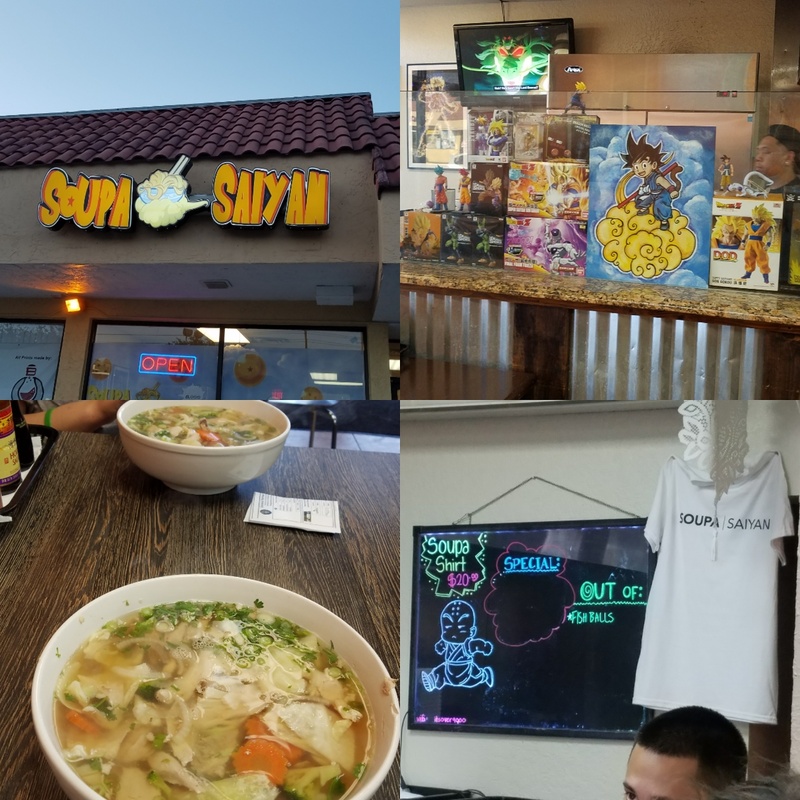 After checking into our hotel, we went to Soupa Saiyan for dinner. It’s a Dragon Ball inspired restaurant that serves Japanese style noodles surrounded by Dragon Ball artwork and merchandise. The lamps were adorned with yellow clouds. Battle of the Gods was playing when we got there, and Resurrection ‘F’ started before we left. Even the walls were an orange crystal texture. I kinda wished I went to the bathroom just to see what was in there. Hopefully something to do with Master Roshi. This was my first time ever eating any Japanese food (I’ve never even had sushi or ramen) so it’s really hard to judge the actual food, but I thought it was pretty tasty. I got udon and Katrina got ramen and needless to say we got two take home containers because they use BIG bowls. You ever watch one of those shonen anime where the main character is a big eater who empties huge stacks of bowls in minutes? Those were the kinds of bowls we got. Goku can eat forty, we barely finished one between the two of us. 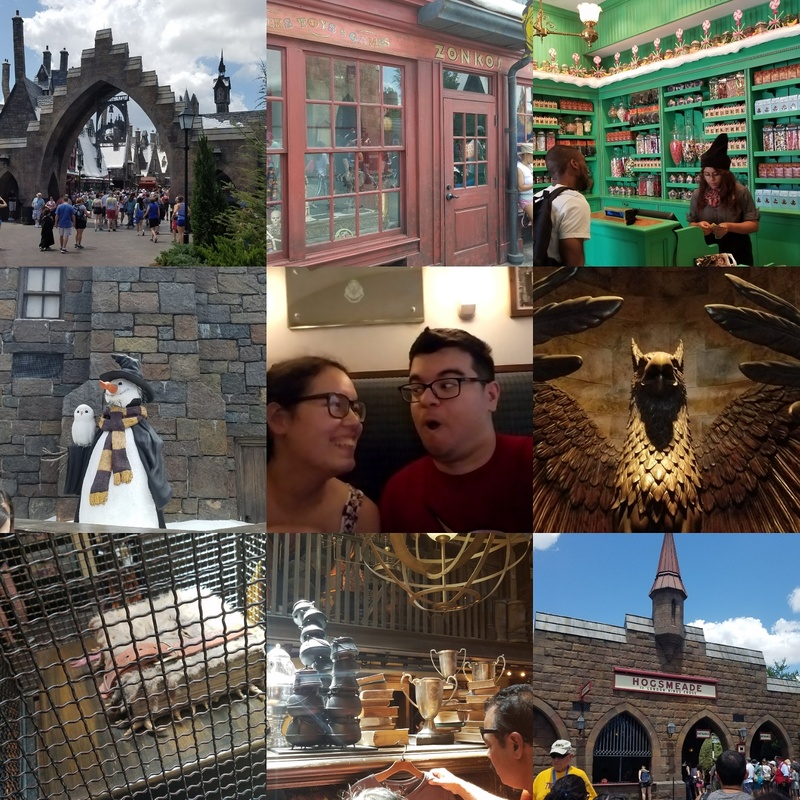 Because we wanted to do the Diagon Alley side of The Wizarding World of Harry Potter first, I made an effort to have our Uber take us to Universal Studios, not Islands of Adventure. Turns out to get through either of them you have to go through an outdoor terminal lobby thing (that may or may not be called City Walk). This area is open to the public and contains shopping and eateries, plus some other attractions like a movie theater and mini golf. From there you reach a fork in the path that leads to either park. 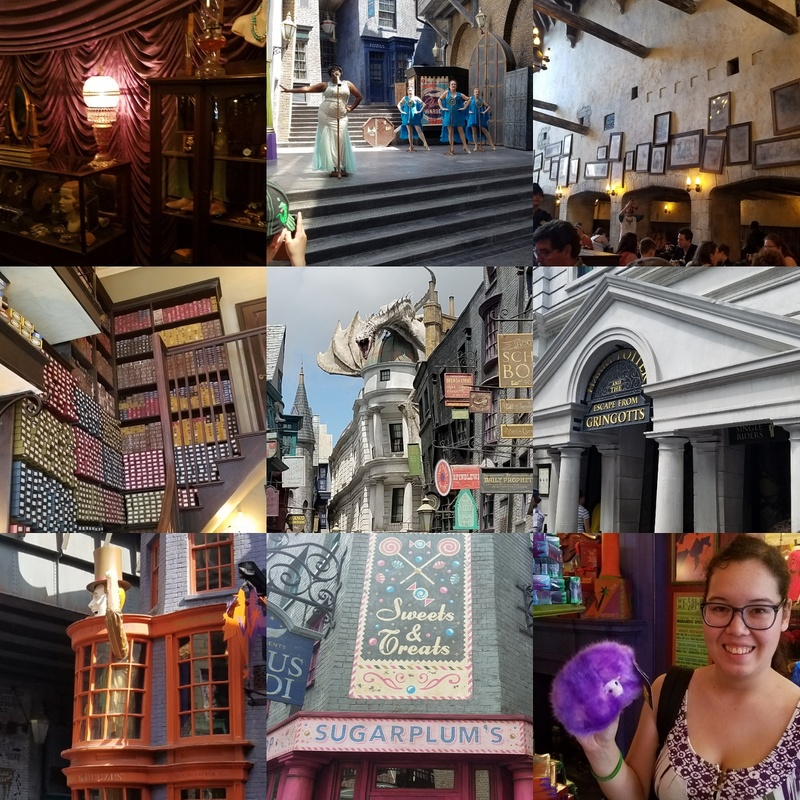 In Universal Studios, we made a distracted beeline towards Diagon Alley, constantly stopping to look into some stores, many of which weren’t actually real places to shop. To get into Diagon Alley you have to go through the brick wall portal and then marvel at the amount of detail put into the design of the area. Most of the places at the park are filled with lots of intricate tiny things you might not notice, but both Harry Potter areas take that to the next level. In between the themed gift shops there are more shops you can’t access, all “closed” forever, but they’re all actual places described in the books and they all look just like they do in the movies. You can buy a wand at Ollivanders, some of which allow you to interact with the windows of the closed stores, eat lunch at the Leaky Cauldron (do it it’s worth it! ), and finally stick around for a performance by Celestina Warbeck, a bewitching singer who does a quick set that, while not exactly magical, is still a great time. The same stage hosted a live performance of The Tales of Beedle the Bard, which is a bit more magical. The main attraction in Diagon Alley is a 3D experience where you strap into a cart at Gringotts and go on a bank vault tour that is interrupted by Harry and the gang trying to steal a Horcrux from Bellatrix’s vault. The story is adjusted to feature Voldemort and Bellatrix, who attack you with some cool 3D spells. Bill Weasley is also there. This one was pretty fun, and that includes the wait. While we were constantly going through the line and starting and stopping to move, the intricate details of the park area were magnified with so many things lining the lobby and offices of the bank. They wanted to make waiting in line fun. After we had our fill of Diagon Alley, we jumped on the train at King’s Cross Station to board the Hogwarts Express at Platform 9 ¾. When you’re sitting in your cabin a video plays out the window showing a variety of scenes from the Wizarding World, while the main characters occasionally pop up in the hallway. From there we were dropped off at the Hogsmeade station which leads to the perpetually wintertime village. Here we saw more fake shops, more real ones, and lots more Butterbeer for sale. Hogsmeade has two roller coasters, Flight of the Hippogriff is a simple affair; Dragon Challenge is of the extreme loopdeeloop variety (I went on these rides as a kid way back when this was part of the Lost Continent). The main attraction in the Hogsmeade area occurs at Hogwarts Castle. After another super fun wait in line, this time going through many iconic Hogwarts classrooms, we join Harry in a Quidditch match where our bench is enchanted to allow us to float directly in the game. The match is interrupted by… everything. We’re attacked by Death Eaters, Dementors, and get lost in the Forbidden Forest where we face the Whomping Willow and giant spiders before getting sucked into the ruins of the Chamber of Secrets. Then a dragon attacks. It was AWESOME. We went back to Hogsmeade and Diagon Alley a few times, mainly to eat lunch at the Three Broomsticks. We both agreed that the Leaky Cauldron is better though, and went back there on our last day for the best chicken sandwich ever made. Marvel Superhero Land has barely changed since I was a kid. All of the giant structures and artwork are taken from the late 90s, and all feature characters who had shows on Fox Kids regardless of how popular they are today. 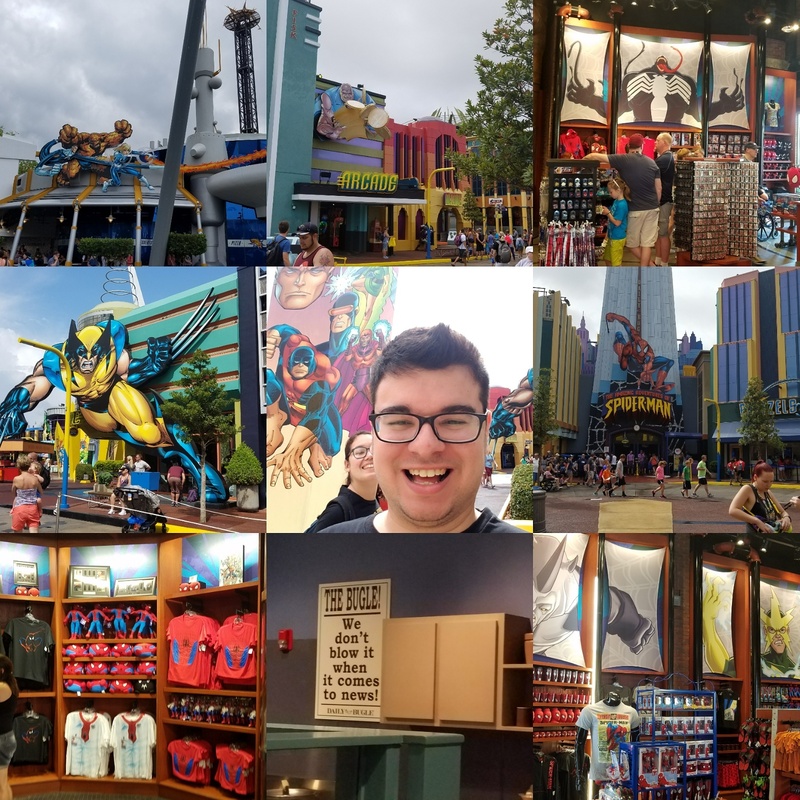 There was Avengers, Deadpool, and Guardians of the Galaxy merch in gift shops, but the buildings were all Spider-Man and X-Men, with some Fantastic Four in there because why not? We went on two of the three Marvel rides. Storm’s was your standard spinning tea-cups with a purple and yellow paint job (for some reason) while the Spider-Man one was a 3D simulation experience. You sit in a car and move on a track that shakes and spins while you go through a tunnel where cool/crazy stuff is happening all around you. The “plot” of this ride is that you’re a team of Daily Bugle reporters on your way to get the scoop on the Sinister Six stealing the Statue of Liberty. Talk about a living time capsule, this ride was super 90s. The animation of the safety videos during the line was straight out of the production house that did the Fox Kids show, and the villainous team included Hydro Man. Remember Hydro Man? And like… that fiery lady Carnage woman? At least the suits look updated. I remember the old 90s Fox Kids designs on the characters you could meet, but this time the suits were a bit more modern. But again, it was all Spider-Man and X-Men. There was talk about Captain America showing up, but we must have missed him. The characters were really fun to meet. By the time we made it here we received a free “Just Married” button so everyone, including Rogue and Storm, were complimenting and congratulating us. Doctor Doom and the Green Goblin were super into character, and Cyclops especially was trying and succeeding to prove he knew his stuff, referencing comic arcs from multiple eras. Unfortunately, the least impressive was Spider-Man, who is so popular we had to wait in a specific line in a separate building to see him. He mistook my usual Power Rangers shirt for the logo of The Flash (as many do) and proceeded to make Barry Allen jokes the whole time. It's a common mistake, but he was just trying too hard to impress me. Universal Studios Florida is divided into mini city sections that I guess are supposed to be like we’re on a Hollywood back lot? We didn’t really do a lot of the rides here except a Woody Woodpecker roller coaster and the classic E.T. ride which hasn’t changed since I was a kid. We also saw a show called Animal Actors on Location, where movie and TV animal trainers showed off cute/fun animal stunts. The Men in Black ride is also pretty much the exact same thing as it was when I first came here. It’s weird that so many old attractions are still up because the cost of replacing them would be huge. I can see Men in Black and E.T. being sorta modern classics. We’ll talk about outdated stuff when we get to Islands of Adventure. The last big area in the Studios section is Springfield, Home of the Simpsons. This one just perplexes me. Yeah it’s a long running show, but it’s not exactly Harry Potter. Is there like a Simpsons “fandom?” It’s not just The Simpsons either, Duff Beer specifically has a lot of focus here. I even saw guys in Duff Beer shirts. 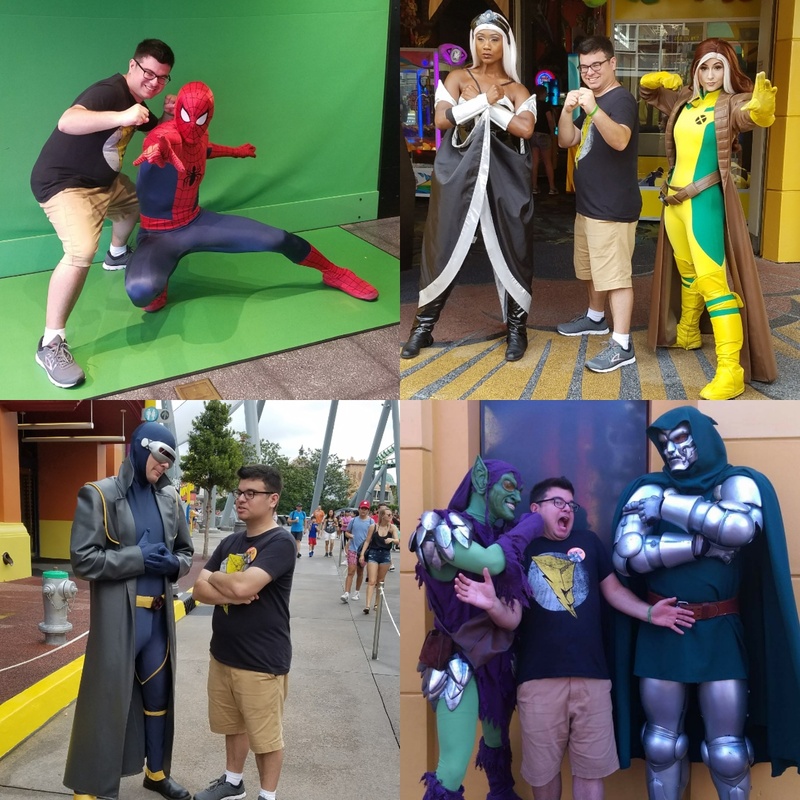 Islands of Adventure is way more fun in my opinion. Each section is based on a specific theme, all of which hold the general theme of “adventure.” Even the entrance area is beautifully carved out of fake stone to give it a sense that it’s somewhere Indiana Jones might journey. Heading to the right we start a circular trip through Seuss Landing, a Dr. Seuss inspired ‘island’ filled with all kinds of his crazy imagination. We went on a Cat in the Hat ride that told the literary doctor’s most popular story through a series of visuals, animation, 3D, animatronics, puppets, and more. Every section was different. We also got on a train ride that was heavily implied to be based on the story of the Star Bellied Sneetches, but it was just the Alphabet story instead. That ride broke down the moment it was our turn, but we stuck with it and hung out with the (very friendly) staff for a bit. There was also a merry-go-round with all sorts of weird Seuss creatures. Beyond Seuss land is The Lost Continent, a mystical land full of fantastical creatures. There’s a guided tour of Poseidon's temple and a Sinbad stunt show and… yeah we kinda just passed through it every day. Beyond The Lost Continent is Hogsmeade and then Jurassic Park, which is a property that was naturally made to be adapted into a real life theme park. I think this is the second best area for immersion and attention to detail. Besides the flagship ride (again, the exact same thing as when I was a kid) there was the Dinosaur Discovery Center, a real science museum all about dinosaurs. We even saw a baby velociraptor hatching! That part wasn't real. A lot of fun was had in Jurassic Park. There is a small Skull Island, which I think is new, but it’s just a single King Kong safari ride that we skipped. After Kong Island is Toon Lagoon. Oh boy, Toon Lagoon. Who is this for?! The ‘island’ features characters from classic newspaper funnies like Popeye, Kathy, Blondie, the Family Circus, and Dudley Do-Right (I don’t know who that is.) I just don’t get it. I actually did some research and it seems like this was one of the original areas that launched with the park in 1999. When I first went as a kid, I distinctly remember our babysitter calling out to my sister “Look who it is.” It was Popeye’s girlfriend (I guess?) and my sister was like, “Who is that?” and I was like, “Uh, I’ll tell you later,” but I really had no idea either. 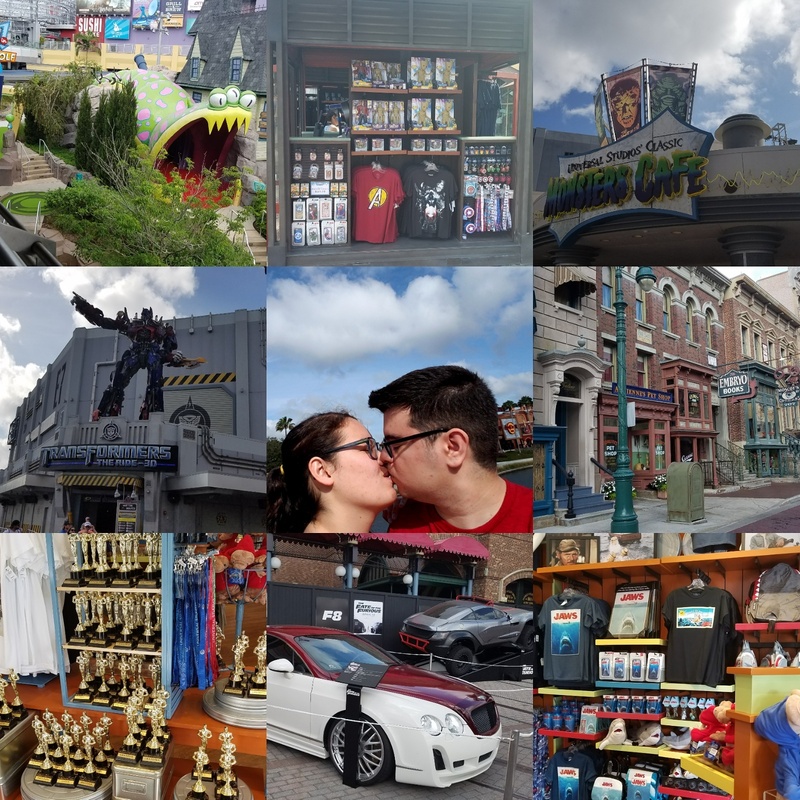 Katrina and I talked all week about how Universal seemed more for adults than Disney, so maybe this area was meant to be nostalgic for adults? But like… were adults in their adulthood circa 1999 nostalgic for Popeye? I am really asking. I know there has been some announcements for Nintendo land and honestly all of Toon Lagoon should be replaced with the Mushroom Kingdom. 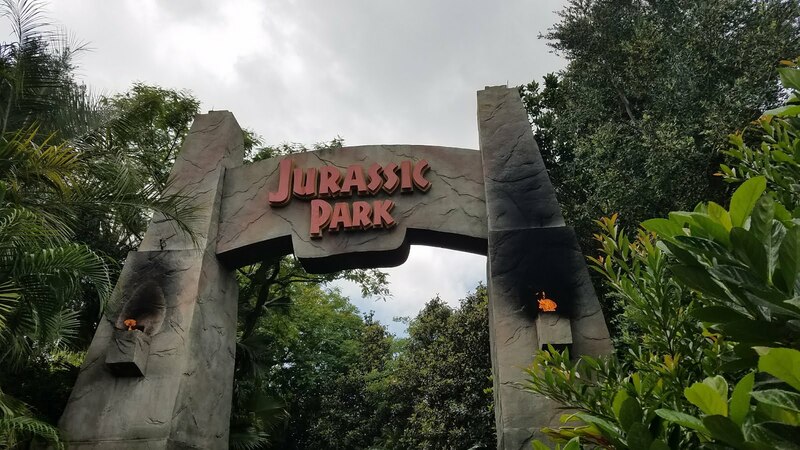 Four days is a long time for two parks, so we just popped in for one last look around on Thursday and headed out to see what else Orlando has to offer. I know the city is almost entirely operated on tourism, but damn. 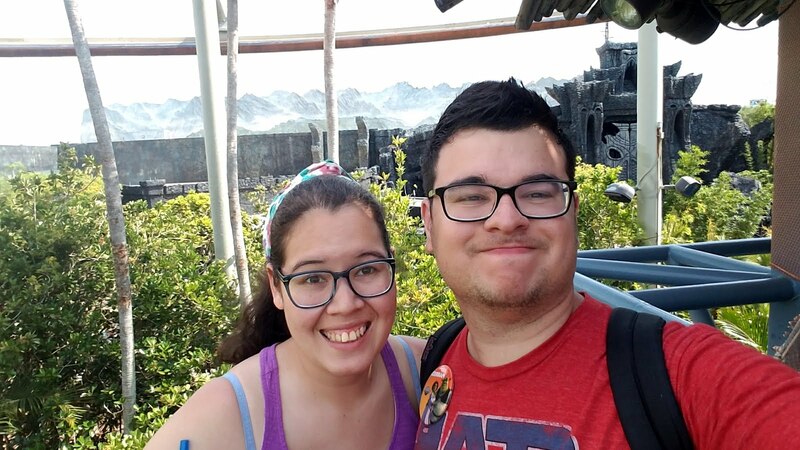 We considered doing something else besides Universal and ultimately got overwhelmed with the options. Besides Disney there was also Sea World and LEGOland in our midst, a Medieval Times, simulated skydiving, laser tag, and loads of mini golf. In our hotel plaza alone there was a mystery dinner theater, bowling alley, Ripley’s Believe It Or Not museum, and I am pretty sure there were TWO arcades. We ended up hitting up a local mall, which was mostly swanky designers, and a comic shop. 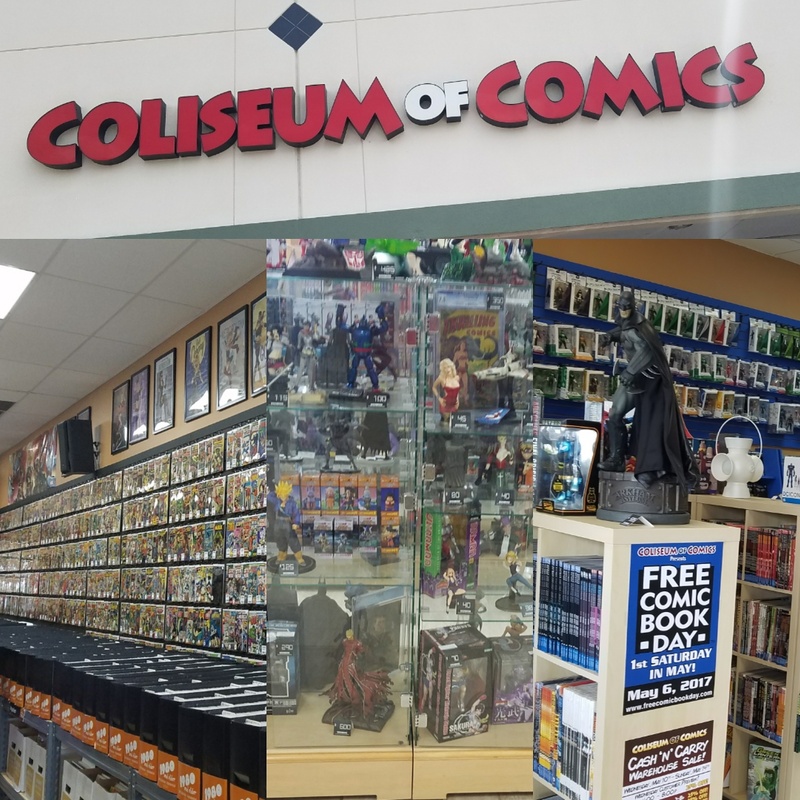 Coliseum of Comics was a blast and I wished we spent more time there. The all-female staff was busy getting ready for Free Comic Book Day and when I asked a simple question I was downright shocked by the answer. 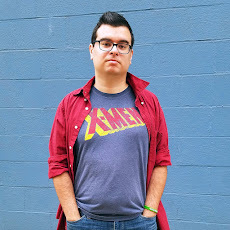 I am looking to complete my collection of Whedon’s X-men run, so I asked “Would The Astonishing X-Men be under A or X?” It was a simple A or B question (or A or X ha ha.) but did she give me a simple answer? No. She got down off of a ladder and checked both sections while explaining that they had some older and some newer and the had the hardback collections but not the trades I wanted and did I mention that she herself checked the A and X sections twice? This is the best comic shop I have ever been to!